1. Fabio Borini was born on March 29, 1991 in the small town of Bentivoglio in Bologna, Italy. He started out at his hometown team before moving to Jose Mourinho's Chelsea in 2007, aged 16. 2. Borini's Premier League debut for Chelsea came as an 89th minute substitute against Tottenham in September 2009. In total, he made four top-flight appearances for the Blues. He was also a member of Chelsea's Champions League squad in 2009-10, figuring as a substitute against APOEL FC. 3. This will be the third time he's played for Brendan Rodgers. He first worked with the boss at Chelsea in the reserve team before Rodgers took him on loan to Swansea City in 2010-11 to bolster the Swans' Premier League promotion push. His faith in the Italian was rewarded with six goals in 12 appearances. 4. Fabio made an instant impact on his Swansea debut, scoring twice against Nottingham Forest in spectacular fashion. Afterwards, Rodgers commented: "There's great joy as a manager in seeing a player who you first saw as a boy producing the performance of a man." 5. After his loan period was up at the Liberty Stadium, Borini left Chelsea and signed for Parma before being loaned to AS Roma before the start of the 2011-12 season. It was here he really began to flourish, scoring nine league goals in 20 starts at the Stadio Olimpico. 6. 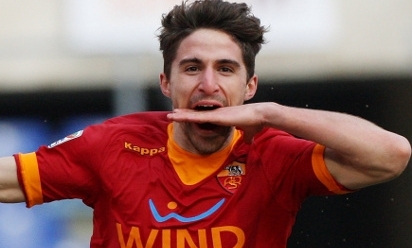 Borini has his own trademark goal celebration - but it's a bit unusual. After finding the back of the net, the forward will thrust his left hand between his teeth. He explains: "In Italy it means you've got the knife between your teeth - it's when you want to achieve something so badly that you are angry to reach your goals." 7. Indeed, Borini was much loved by the Swansea fans for his ecstatic celebrations. The man himself admits it's a trait he's learnt from his idol, Italy legend Filippo Inzaghi. "I like Inzaghi. I like the way he celebrates a goal even if his team are winning 6-0. And look at what he has won - the World Cup, two Champions Leagues and many league titles in Italy. Even if you have half his career, you will have had a great career. I have watched Inzaghi a lot and I have got something from him." 8. It's fair to say our new boy aims high. He once said: "I always set a goal target. I try to score a goal in each game I play. Sometimes it's not possible, but that is always my aim." 9. Fabio already has experience of playing at Anfield. He started for Chelsea U18s in an FA Youth Cup clash in front of the Kop in February 2009, though he left disappointed as a David Amoo goal secured a 1-0 win for Liverpool. 10. Borini made his international debut for Italy against the USA in February. He was named in Italy's squad for Euro 2012 in Poland and Ukraine, though the youngster didn't make an appearance. He also captained Italy U19s during the 2010 European Championships.